Medication management for older people presents an extraordinary challenge for today’s healthcare professionals, patients, and families. Because we are living longer, many older adults live with several chronic conditions that are treated with multiple medications. In fact, people aged 65 and older are taking twice as many medications today as this same age group did in 1990. Older adults often see several specialists who prescribe medications, a process that is not always well coordinated. This, combined with prescriptions being filled at multiple pharmacies, can make monitoring and managing medications and their interactions challenging for clinicians, patients, and families. As a result, older adults may end up taking combinations of medication that do not interact well with each other or even take unnecessary medications—all with potentially harmful yet often preventable consequences. Adverse drug reactions and interactions are a major factor in delirium and falls and can lead to increased emergency department visits and hospital admissions. And with $7.2 billion in healthcare expenditures attributed to the use of potentially inappropriate medications (PIMs) in 2000-2001, we all pay a price—one that neither our healthcare system nor individuals and families can sustain. 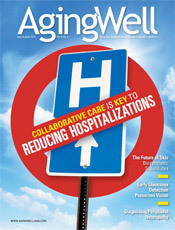 Though the age demographic is shifting, education in the special healthcare needs of older adults is not keeping pace. Many health professions do not require training in the unique healthcare needs of older adults, such as managing multiple complex conditions and medications or changes in function or cognition. Geriatrics training includes these areas and also focuses on understanding and incorporating patients’ goals of care and working with patients and families as partners in healthcare decisions. To be active partners, the public needs to be better educated about older adult health and chronic disease and medication management. Despite numerous studies over the last two decades of PIM usage in long term care, outpatient, acute care, and community settings, many PIMs are still being used as first-line treatment for the most vulnerable, frail older adults. The AGS’ new version of the Beers criteria, created in 1991 by geriatrician Mark H. Beers, MD, is designed to assist clinicians in making informed prescribing choices for older adults, not to dictate or regulate prescribing practices. It’s something for clinicians, patients, and families to be aware of and to communicate about openly. — Jennie Chin Hansen, RN, MSN, FAAN, is CEO of the American Geriatrics Society.